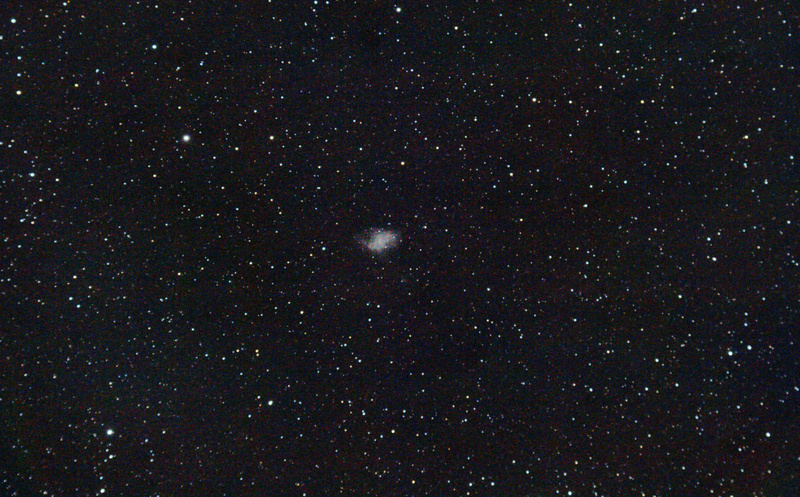 After my series of open star clusters, I decided to try my luck with the neighboring Crab Nebula (Messier 1). A single 30s exposure show some signal, but barely above the background light pollution. After stacking 28 frames, and various histogram and level stretching, I was able to get the nebula to stand out. That’s quite an improvement from the single frame from above. I couldn’t get any color out of it, but I believe the color images of the Crab Nebula that you often see are compositions from narrow band filters, and are “scientific colors”. Conclusions, need to gather more light and image at a longer focal length. Even if I increase my exposure time, as the object is small I won’t be able to get much detail out of it. I could add a barlow to double the focal length, but would also need to further increase my exposure time. If I try this again, I’d need a 2x barlow and at least 2 minutes exposition, and have everything autoguided. Not there yet… Best reserved for larger and more powerful telescopes. This entry was posted in Image Processing, Photo and tagged Astrophoto, Astrophotography, Messier, Nebula by Benoit Guertin. Bookmark the permalink.